Our touring Forum Theatre production on mental health allyship. From the company that created the popular Forum Theatre production on teen anxiety, HALF FULL, comes a brand new production on mental health and psychological well-being: IN YOUR HEAD! IN YOUR HEAD takes us into the lives of Rayna and her brother Sam as they deal with the increasingly complicated world of high school and “growing up.” Why is Sam suddenly having a hard time at home and in school? How can they be there for one another? Is there anyone else that can help out? Written by renowned playwright Luciano Iogna and directed by MCT Artistic Director Simon Malbogat, this interactive Forum Theatre show will specifically focus on the stigma against mental disorders and engage students in a dialogue on how we can all be better mental health allies to each other. Like all our Forum Theatre productions, this show is inspired by real stories from teens to ensure that our play reflect the issues that matter the most to your students. Want to preview before you book? No problem. 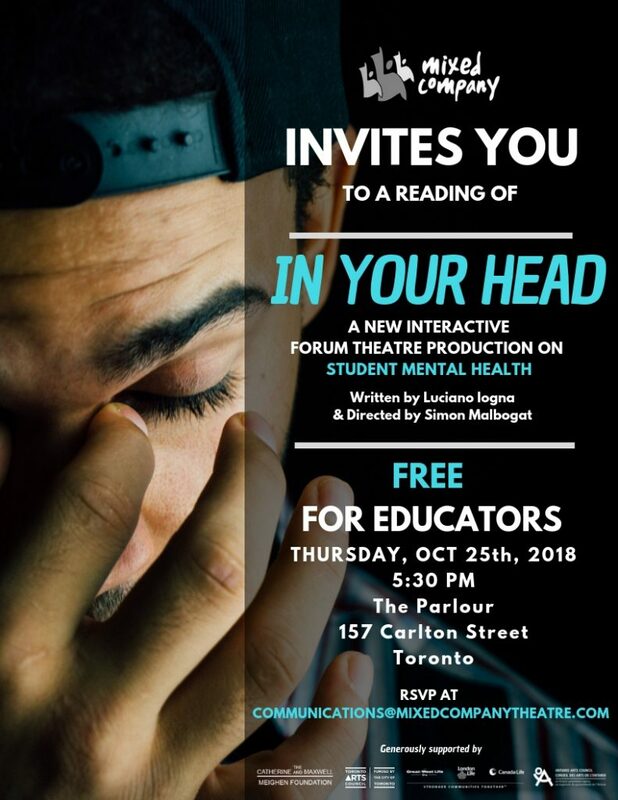 We’re hosting a FREE reading of the play for educators on Thursday, October 25th, 2018 at 5:30 PM in The Parlour at Saint Luke’s United Church in downtown Toronto. Check out our invitation below for more information! We have DISCOUNTS for multiple performances! Do you have a neighbouring school who would be interested in hosting another performance? Let us know and you will both pay less! Our dates are booking up fast so we recommend reserving as soon as possible to guarantee the best availability for you and your school. Contact us at communications@mixedcompanytheatre.com to book now!